Well, we are back in the United States after almost six months away in East Asia. I (Au) was concerned about being able to adjust to the change, not the least of which being the climate. We left Singapore when it was 30 Celsius (about 86 F) and landed in Newark at 3 degrees Celsius (about 38 F). Once at home, I quickly found my warm weather clothes that had been boxed up since last October. 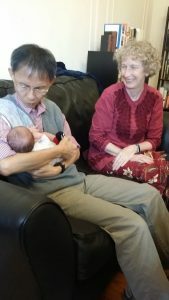 We were able to hold our new granddaughter Frances just one day after we arrived and Eunice stayed on in New York City for a week to help with cooking, cleaning, and night-time baby care. I have been at home, slowly absorbing the new routine around me (and working on our tax filing). Familiar chores have helped with the adjustments: sorting the mail (you should have seen the mound that awaited us), taking out the recycling on Wednesday evening, the same with the trash the next night, and ironing my shirts in the basement. Going to bed early has also helped with the jetlag and transition to this time zone. We have visited two of our supporting churches to say hello, and to meet people new to us since we were last there. As we caught up with partners, friends, and neighbors, we are aware that their lives have also been in motion. We are learning to tell short stories, sharing snippets of our experiences overseas. Most people know we have been away even if they are not quite sure where exactly we’ve been, so our nomad existence of the past three months is definitely hard to follow. By comparison, we will be quite stable on the East Coast for the next few weeks. 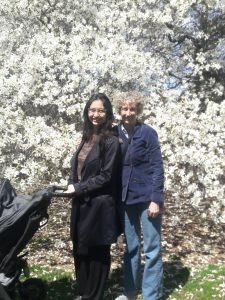 We are grateful for all of your prayers and support as we reconnect with family and friends, and then pack up again in late May to travel back to East Asia. 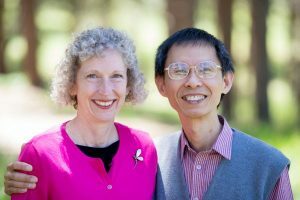 The administrative process for our visa application has begun and will take its course out of our control, but we believe it is in God’s sovereign hands. He is never late and always on time, and we rest in that truth. He will indeed and we are thankful that the process is moving forward. It is good to learn and get the opportunity to practice an ACTIVE faith in God.